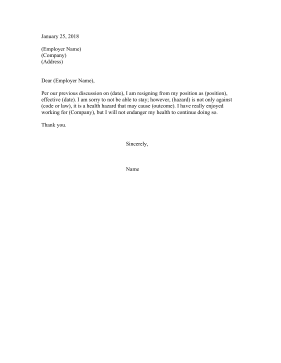 Whether it's for a health hazard or a dangerous working condition, this resignation letter can help employees extricate themselves from a bad workplace situation. Per our previous discussion on (date), I am resigning from my position as (position), effective (date). I am sorry to not be able to stay; however, (hazard) is not only against (code or law), it is a health hazard that may cause (outcome). I have really enjoyed working for (Company), but I will not endanger my health to continue doing so.